In one of my earlier posts I had mentioned some of the things I was enjoying doing with my Nokia N900. Now that I have had the device to play with for a solid month I would like to highlight what I feel are the pros and cons of the device. As I know most people just give these articles a quick scan in the first place, for reference I am just going to post my thoughts in an easy to read bulleted list. Nokia Sponsored Community Repositories - FOSS applications written (or ported to Maemo) by the community are housed in an official "extras" repository. Installing additional applications from here is as easy as adding software to Ubuntu via the software center. TV Out - Provided with the phone are RCA cables to hook your N900 into a television/projector that hook into the headphone jack. Fantastic Browser - The N900 arguably provides the best mobile web browsing experience out there. USB-Micro Charging - The N900 charges via a standard USB micro connection, instead of some odd proprietary jack like many devices. Crystal Clear Screen - The 800x480 resolution is beautiful! Everything displayed on the device is crisp and clear. Battery Life - With heavy usage the N900 dies in about 6 hours. While this is still fairly good I've found I run the battery out almost every day from usage so I've taken to carrying a charging cord with me. Maemo Libraries - Maemo 5 is not compatible with most Debian Armel packages. This is because Maemo uses older library files for many (most notably libc6) packages. Updating said packages manually causes Maemo to stop working in most cases. Default Filesystem Setup - The default file system on the N900 is super non-standard and is my biggest complaint about the device. It contains a 256meg rootfs, 2gig ext2 /home, and 27gig fat32 storage. You can adjust these, but it is difficult to say the least and not something a new Linux user should attempt. Non-Standard Key Maps - Some of the key mappings on the N900 are not the same as a standard keyboard. As a result some Linux applications that are ported need to be remapped to work fully. Awkward Placement of Charging/Headphone Ports - It is awkward to hold/type on the device while either (or both) of these are plugged in. Not impossible, but still annoying. Did I miss an pros or perhaps do you disagree with one of the cons I listed? If so, please feel free to drop a comment to let me know. Also if you are looking for some good N900 applications check here and here. I mentioned in one of my earlier postings this month that I had recently obtained a new smart phone. Now picking out a smart phone is no easy task in today's market. There are piles of devices to choose from, each of which has different pros and cons to go along with it. When it comes to technology I try to always be a very informed shopper; a computer is something I am going to be using often and typically for a good deal of time. I was under contract with AT&T, but that was about to expire so I did not limit my phone search to a single company/service provider. I went store to store first (a strange experience I will admit, normally I do most everything online). AT&T has their iPhone, Verizon the Droid, Sprint the Palm Pre, and T-Mobile the G1. After going in and playing with the devices I was fairly impressed with the two running Android based operating systems. Next I took to the internet to do more research, which is where I discovered two things: First, through the suggestion of a friend I found the device I ended up purchasing and currently enjoy very much - Nokia's N900; Secondly I learned more about "rooting" or "jail-breaking" phones. Odds are you have heard at least one of these terms before, "rooting" refers to gaining access to the "root" account on an Android device and "jail-breaking" was coined as the term for gaining full access to an iPhone (it references the phone escaping from the "Apple jail"). Neither of these processes is very difficult to accomplish with a small bit of know-how and it's your phone so you should be able to do with it as you please. On the yes aspect, yes you can do what ever you want with your phone. No one is going to knock on your door and tell you its illegal (although if Apple had their way it would be illegal). Now for the no aspect: in both the case of Android devices and the iPhone, rooting/jail-breaking is discouraged and frowned upon. For both types of devices (Android based and the iPhone) if you bring them in for service while they are "hacked," the companies have been known to refuse to honor warranties. Beyond this if your rooted device suffers from an issue with an application the fact that the phone is jail-broken is a reason to refuse service. At this point there is no questioning it: Our "smart" phones become more and more like a normal computer and less like a telephone each day. They surf the internet, instant message, play games (in full 3D in some cases), install applications, manage our music and other various media to name just a few likenesses. If the devices behave and function as a normal computer why can we not hold them to the same standards as such? Would you buy a Linux PC you didn't have the root password to? How about a computer running Windows that you weren't given the administrator password for? What is worse than this, I feel, is the fact that people have come to expect to be locked out of their own hardware by default. Since I've gotten my N900, I've lost track of the number of people who asked if I plan on "jail-breaking" the device. I always respond with "No". A large contributing factor to my purchase of Nokia's latest internet tablet (that's right it is a computer first and phone second) was that they allow the user unrestricted access to the device with out any hacks or cracks. What are your feelings about the smart phones on the market today? Did I miss any key points or perhaps do you disagree with something I've said? In one of my past articles I made a bold assessment that it appeared Transgaming might be dropping support for their Cedega Wine software. However it now appears that Cedega might be hanging in there - After more than a year of silence there was finally an update posted in Cedega's "Den" (announcements section). The post promises the certification of two games, Torchlight and Defense Grid: The Awakening, that happen to work well under their "recently" released 7.3.3 engine (The latter of the two pleases me greatly, I had purchased DG on Steam over the holidays and it does not function properly under Wine/CXGames as of yet). Also provided is a very vague "Development Update" that promises better OpenGL performance and mentions that at some point in the near future we should see a more detailed development plan - Alas two weeks later and still nothing. In the end what does all this mean? Maybe nothing, but then only time will tell. I'm hoping that Transgaming gets around to posting development updates faster than they have been about fixing their application voting system (which has been non-functional for close to two years now). If Transgaming want's to save their Linux product they need to get on the ball - and quick. They are no longer the only big player in the world of commercial "Win-on-Lin" for gaming. Codeweavers has already posted their plans for development in 2010 and since they already support L4D2 (one of the most recently released hit PC titles) Transgaming is going to be hard-pressed to play catch-up. As I've said in the past: I think Cedega is good software, however there is more to buying software than just the product itself. Here is to hoping Transgaming can get their customer service act together in 2010, because - while I like CXGames, competition is a wonderful driving factor in the business world. My little niche here on the internet is largely devoted to talking about various forms of the Linux Operating System. Truth be told, however, I can blog about Linux until my fingers fall off from typing and the vast majority of what I wrote would be meaningless to the average person. Even with its slowly growing popularity, Linux is still a largely unknown thing to many people. Why should Average Joe care about Linux? This alternative operating system doesn't affect his life at all - or does it? The truth of the matter is this: Almost every adult who uses technology in today's world uses or has used something that is Linux powered. These companies use Linux both as a server back-end and as a desktop solution. The postal service uses Linux clusters to sort bulk mail and the federal court system uses Linux systems for case management, case tracking, accounting, and probation services. They use Linux based production machines for rendering 2D art work, 3D graphics, and special effects. Yep - you guessed it, both are Linux powered devices. Are all high-end devices running various forms of mobile Linux. Both companies are largely (or in the case of Amazon - almost entirely) powered by Linux. In addition to these, it relatively safe to say around half the internet runs on Linux powered Apache servers. 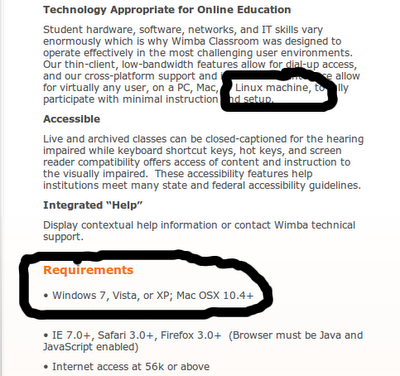 Does anyone else know of some other common places Linux is used by the masses or another large retailer/company that is Linux powered that I missed? If so, please drop a comment to let me know. Update: Check out this article for a whole pile of places that are running Linux! I've done a few benchmarks to date and today I am going to add another interesting set of numbers to the list. Unigine is a cross-platform real-time 3D engine, I stumbled across awhile back on some message boards I am a part of. Since it is cross platform it offers the benchmark rendering in both OpenGL and DirectX APIs, as such I was curious as to which of the interfaces that are commonly used for 3D development offered better performance. The Tests: Unigine offers two free benchmarks - Tropics and Sanctuary. I ran both demos using OpenGL, DirectX 9.1, and DirectX 10.0 under the 1680x1050 resolution. The Hardware: While my hardware is not fastest in the world it is (as of posting this) relatively new and decently quick. Processor - Intel p9700 2.8ghz Dual Core, RAM - 4gigs of DDR3, Video Card: nVidia 260m with 1gig DDR3 dedicated memory (Running the latest stable nVidia driver 195.62). Clearly DirectX 10 appears to be the optimum choice performance wise. In the case of the tropics benchmark it scored about 12% higher and for Sanctuary it scored around 16% higher. Worth noting is that while running the benchmarks there really isn't truly much detail difference between the rendering in the three different selections (meaning most people would not be able to tell the difference between which of the three was is use). Also I'd like to mention for any who may not know that OpenGL as the name implies is free open source software and runs fully cross-platform (where is DirectX is locked to the MS Windows and XBox) - so if you want to develop for a wider range the slightly slower OpenGL may be the best choice of the three to use. Ignore for a moment the fact that they refer to "PC" as an operating system and just check the two parts I've high-lighted. Anyone else confused slightly? At any rate the software loads right up for me on Ubuntu 9.10 using Firefox and the latest Java - but still. At any rate it made me face-palm and gave me a good chuckle for the evening. Anyone else get annoyed when you see things like this? Web Browser: The N900 has the best mobile browser I've ever used (its built on firefox technology). Not only does it support full flash (9.4) but it renders page beautifully on the 800x480 resolution screen. Camera: The little bugger packs a 5.8 mega pixel camera with an awesome flash. It takes both high resolution photos as well as decent quality video. Music Player: The N900 has 32gigs of internal flash memory along with a slot for a mircoSD card that will take up to additional gigs - it holds a lot of media. In addition to this because of the full flash support I often stream internet radio on my N900 - as if this was not enough the little computer also packs a FM radio receiver/transmitter. Video Player: Little bugger also does video out via a set of included RCA cables. The media player supports a wide slew of codecs as well, I watch movies off the little guy. Calculator: My favorite CAS works wonderfully on my N900 fully - it makes a great little calculator. Terminal: God I love cracking out commands in terminal. Lastly, I've been using apt-get to install applications on my tiny computer and sshing into my remote server. All in all I am quite enjoying my latest toy and new software packages are being developed for it every day that only expand its usability further (there are currently packages in testing that turn it into a Wii-Mote and/or a PS3 controller). Heres to hoping 2010 brings many fun new toys! Things Worth Noting: Obviously all the applications run faster natively under Windows than they do under Wine technology (I hope no one is surprised by this). Secondly I'd like to point out the FPS averages for Wine 1.1.35 and CXGames 8.1.4 have improved from older versions. Lastly I feel I should mention the n/a score Wine has on Left 4 Dead 2 - this is because try as I might no matter what hacks/cracks I throw at Wine I can still not get Left 4 Dead 2 to play for me under Wine. Wrapping Up: Obviously if you are extremely worried about getting every last FPS out of your video games you should stick with Windows - however depending on your hardware and what games you are playing Linux may very well be capable of playing them at a satisfactory level (remember the human eye can only see 60 fps, so anything higher is overkill). Also remember that with almost every new release Wine continues to further advance it's performance so be sure to check back for new benchmarks/scores as new versions are released. Happy New Year to everyone and keep on fragging!